By purchasing this pack, you are investing in the education of Dennis and Faith Kimambo's daughters in Kenya, Africa. The pack is set at $1. Simply increase the item quantity below to increase the dollar amount to reflect what you want to give. By purchasing this pack, you are investing in the education of Dennis and Faith Kimambo’s daughters in Kenya, Africa. The pack is set at $1. Simply increase the item quantity above to increase the dollar amount to reflect what you want to give. While Paypal levies a 4% fee on each transaction on our end, all of the remaining funds will go directly to the girls’ education. 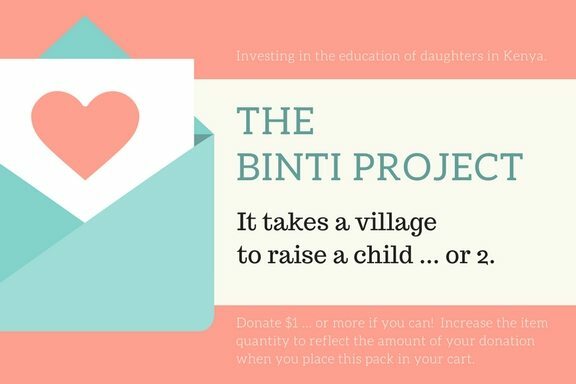 Click here for more information about the Binti Project, why it’s important, and how you can help.